So much for the Saudi Arabian government’s latest claim that it didn’t intend to kill Jamal Khashoggi, and his death just sort of happened. That claim – that nothing was premeditated and that things got out of hand when a fistfight broke out – wasn’t exactly going over well to begin with. But now video footage reveals that so much planning went into Khashoggi’s murder, the Saudis even invoked a body double with a fake beard. After the Saudis murdered Jamal Khashoggi inside their consulate in Turkey, they tried to fool the Turkish government by sending a body double out the front door disguised as Khashoggi. They went so far as to dress the guy in Khashoggi’s clothes and glasses, but screwed up by failing to have him wear Khashoggi’s shoes – and everyone spotted it after CNN aired the footage today. Okay, so they’re not very good at this – but where did they get the fake beard? Do foreign consulates normally keep fake beards lying around, just in case the need arises? The fact that the Saudis had this on hand, and that it just happened to match Jamal Khashoggi’s thick goatee, strongly suggests that this was indeed premeditated. 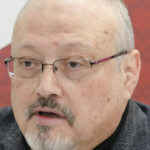 They wouldn’t have had the beard on hand unless they were planning to impersonate Khashoggi – and they would only have needed to do that if they were planning to kidnap or kill him. We’re quickly learning that this murder plot was nothing short of diabolically insane. This is something out of a rejected James Bond script. Not only is this sounding more premeditated all the time, it’s sounding more and more like the kind of sophisticated plan that these Saudi government henchmen wouldn’t have even tried to pull off unless they had the approval of the Crown Prince. This just keeps getting more horrific.